Scholastic Early Learners: Interactive board books for hands on learning! An exciting new series of early learning novelty board books that combine Scholastic's strength in learning with beautiful photography and clear designs to stimulate early learning. 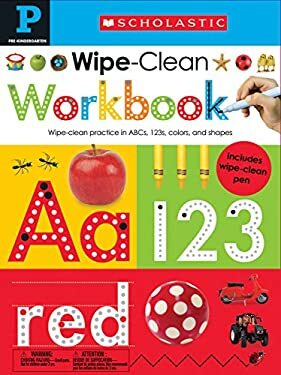 Wipe Clean Workbooks - Pre K is a colorful, wipe-clean workbook to support children in their early learning. Provides plenty of practice for children on a wide range of early learning topics. A wipe-clean pen is provided, the wirobound book lies flat, and the glossy card pages are easy to wipe clean so that children can practice until they have really mastered a topic. This Pre-K book focuses on writing letters and the sounds they make, writing numbers, sequencing, colors, shapes, and opposites.